This is the summary of consumer reviews for Household Essentials 80-Pocket Hanging Jewelry and Accessories Organizer, White Vinyl. The BoolPool rating for this product is Excellent, with 4.50 stars, and the price range is $8.39-$25.76. The Household Essentials 80-Pocket Hanging Jewelry is made of durable vinyl construction with metal hanger option that keeps all fine jewelry or accessories protected and within hand reach. This hanging organizer features transparent 40 pockets on both sides, and the soft, clear PEVA protects the accessories from nicks and scratches. The organizer has smaller pockets on the top to hold small and light weight items like earrings or clips, and larger pockets at the bottom can hold little big or slightly heavy items like necklaces, hand mirrors, hair accessories etc. One side of the organizer also has horizontal pockets which can easily accommodate items like sunglasses, watches etc. With a built-in hanger and sleek looks, this organizer can easily slip into any closet or can be hung on any door or clothes hook as per choice. However, this handy organizer is not very durable if loaded with heavy or bulky items. It is necessary to balance weight with items otherwise the average quality hanger material snaps and slips off easily. It is observed that the organizer’s hook/hanger part can sag due to its limited strength and the plastic cover of the pockets rips off easily if stuffed with bulky items. 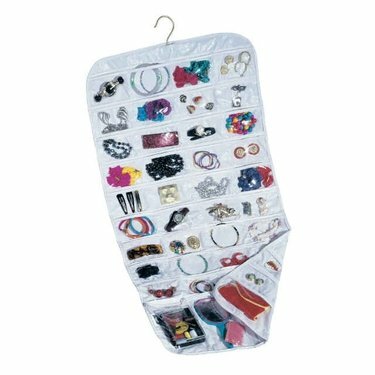 Overall, the Household Essentials 80-Pocket Hanging Jewelry and Accessories Organizer is an efficient and tidy way to get rid of cluttered accessories boxes. The useful features and affordable price makes it perfect either for home organizing, dorm room setup or gifting option. Great for small bedrooms because it doesn't take up any space on your counter tops like a regular jewelry box would. This jewelry organizer has sorted out a huge mess for me. Used to be, my jewelry was in four different boxes that took up valuable space in my very small bedroom. and I've no jewelry box. It's very convenient and doesn't take any space in my closet. Prior to using this product, my jewelry was stored in a jewelry box. It does everything I need it to do, and doesn't take up too much space. After taking the items out of the box and putting them into this organizer, I found that I wore different jewelry every day because it was so easy to see and access what I've. Best $12 I've spent in a long time!. I've a set of four hooks that I use to hang my coat on my bedroom door, and I hung this on one of the hooks. it doesn't only have to organize jewelry, there are plenty of other little things in one's life to organize. use this to organize jewelry. Great way to stay organized!. Something to organize my jewelry with. All my pieces are now organized and clearly visible. Great way to organize your jewelry though. I gave four star,because its really good to organize my stuff.But some of my jeweller cant hold the wait.Its great for small items but not for my necklaces or bangles.Its really great to see all my stuff it nicely organized and the product isn't bad.the price is very reasonable. It works for organization, but I ordered another (a little more money) on Amazon and it's MUCH better than this one. This's a great way to store and organize your jewelry. 2) place each piece of jewelry in each little see-through pocket. They typically hold more weight. Holds all my jewelry and sunglasses. Hope the duct tape holds!. I PURCHASED THIS BECAUSE I LOVEEE JEWELRY BUT MY 2 JEWELRY BOXES AND DRESSER COULDNOT HOLD ANYTHING ELSE,SO I BROUGHT THIS AND BOY WAS IT WORTH IT!I'VE FILLED UP ONE SIDE WITH 75 PAIR OF EARRINGS OR PIECES,AS I STATED ONE SIDE BECAUSE BOTH SIDES HOLD JEWELS SO I'VE NO WORRIES IF I CHOOSE TO PURCHASE MORE!! !LUV THE FACT THAT THERE ARE DIFFRENT SIZED POCKETS TO HOLD JEWELS AND THE HANGER CAME IN HANDY TO HANG ON MY BEHIND THE DOOR RACK(OUT OF SITE)KEEPING IT EASILY ACCESSIBLE THOU!. It holds up, even after all this time. Whatever was holding the hanger inside snapped and it slipped right out of the organizer. However, I use it to hold my less-used make-up, and I hang it in my bathroom. I was worried about whether or not it'd hold up when being used. love this organizational tote for my jewelry...I was looking for something to hold my vast array of costume earrings....and here it's! I can see each pair at a glance...and it makes them so easy to find. The plastic part holding the jewelry fell off the hanger after only one day. This item is nice if you're storing very lightweight items, like earrings. It fits so easily on a hanger in my closet and keeps the items organized and easily identified. It makes items visible and ready. This item has ended my jewelry clutter. I was initially looking for a jewelry box and in my searching came across this item. The pockets are a little small for some items, but it's workable. I put watches, bracelets, necklaces & some earrings in it, as well as hair clips, pins and various other miscellaneous items. When I knew that I was going to get a second to hold more items I began alternating bracelets with earrings so now I'll also be able to pair up my earrings with the outfit or bracelet. All my favorite jewelry items are easily accessible from it. Concept on this product is good but needs to have someway to close each compartment as items fall out. Various size pockets for storage. I love this for my jewelry,there are a lot of storage pockets and the transparent pockets are great. Has lots of pockets for storage. I like this product's individual pocket storage as well. Different size pockets would be my only suggestion. I love the individual pockets of this little organizer. However, the back has 4 horizontal pockets instead of the vertical pockets seen that can hold sunglasses, etc. I think it may be necessary to have this difference, but I don't get as much use out of the horizontal pockets. I can fit the large "wing earrings" in a pocket. Also, the pockets are really small. Clear pockets makes it easy to find jewelry I'm looking for and the price was right.